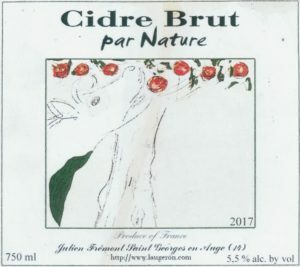 Julien Frémont is a cider and Calvados maker from Normandy who makes cider the same way that his family has made it since the early 1700s – and using the same beautiful wooden press that the family has owned since that time. 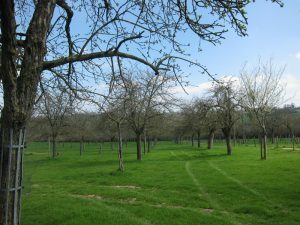 The only differences between the old way and Julien’s way is that he prefers dry cider and the traditional approach was to make sweet cider in this region. Julien tends his orchard using organic and biodynamic principles. Cows graze between the trees to keep the ground cover healthy. After he hand-harvests the apples they are carried to the loft in the large, ancient building that dominates the farm using a ‘home grown’ pulley system of little buckets that carry them upwards. Here he ‘cures’ them for at least a month and sometimes for many months so that the flavours concentrate as the apples dry out. This dramatically reduces the juice yield when the apples are finally pressed but significantly improves the flavour of the cider. We find his ciders immensely satisfying and beautifully crafted and he uses no additions. No sulphites are added at any time. There are also some oxidative notes to his cider as the wooden barrels he uses are over 100 years old. This adds even more complexity to the finished product. 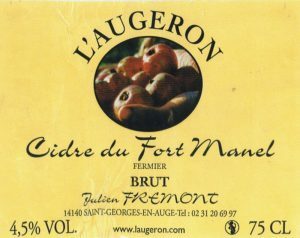 This enticing cider begins with a very slow natural fermentation of the juice during the cold Normandy autumn and winter. The cider is then bottled and continues fermenting in the bottle until the sugar is fermented out. This usually results in an alcohol level between 5.5% and 6.1% and the current batch is 5.5%. Julien makes two special ciders from different terroirs. This one is made from apples picked from trees that grow in quartz (silex in French) soils on the higher slopes above the house where the ground is littered with quartz “cailloux” (small rocks). The cider reflects the minerality of the soils. We believe that it is the best version of this cider he has ever made! This year it is particularly delicious due to the weather during the growing season. We are very impressed with it – it will be great to have it around this spring and summer! 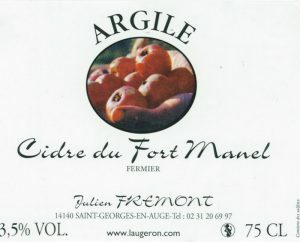 Julien makes two special ciders from different terroirs. This one is made from apples picked from trees that grow in clay soils on the lower slopes near the road that runs in front of the house. Here the clay is quite deep and is packed with minerality leading to very healthy trees due to the good drainage. This year it has a delightful hint of sweetness without being overtly sweet. It also has a tiny tang of refreshing bitterness at the end of the palate. Julien makes his pear cider in exactly the same way as his apple cider. The pears are hand-harvested and then placed in the attic to dry out for a few weeks to concentrate the flavour. 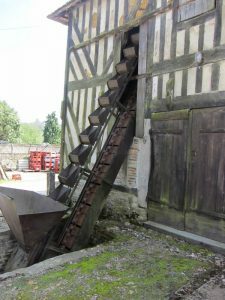 Following the drying out process they are pressed using the ancient press that has been in the family for generations. The juice is then left to ferment naturally before being aged in very old barrels. This is a fine cider with lively bubbles, an elegant pear taste and a long, lingering finish. We only have a small allocation of this tasty drink so it will not last very long. 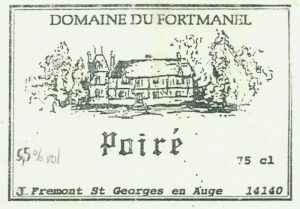 The label might look a bit rustic, but there is nothing rustic about what is inside the bottle. It is the most elegant, smooth, flavoursome Calvados that we have ever tried. Despite the 42% alcohol there is no hot burning sensation in the throat with this drink, just a smooth, supple and immensely satisfying experience. 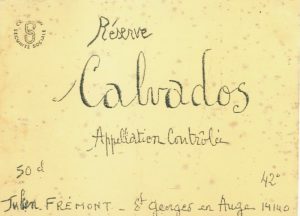 Julien’s family has been distilling Calvados from the cider juice for hundreds of years. In the old building there are registered alambic stills dating back many years. This Calvados is typical of the style produced in the Pays d’Auge region but all the better for being produced from organic apples! This Calvados is labelled as Réserve which means that, by law, it must have been matured for at least three years in old wooden barrels.